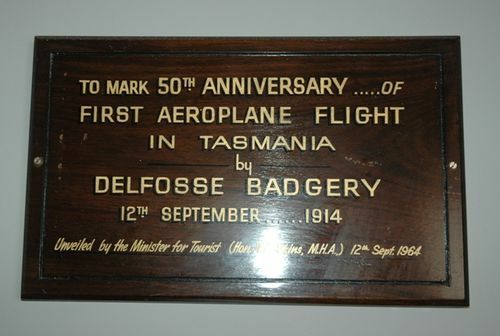 A plaque commemorates the 50th anniversary of the first aeroplane flight undertaken in Tasmania by Delfosse Badgery in September 1914 in a Caudron biplane. On September 1914, nearly 2,000 people were attracted to the show ground at Elwick to witness the first public flying machine demonstration in Tasmania by Mr Delfosse Badgery, the son of a Moss Vale squatter, and the first aviator to bring a machine to Tasmania. Two special trains were chartered to run from the city, at a charge of 2s. 6d., including admission to the show ground. Those who otherwise got there paid 2s. admission. Though the afternoon was chilly and showery, with occasional bursts of sunshine, the affair was well patronised. Mr Badgery had advertised to give demonstrations of military aircraft work, including bomb dropping flour bags to be used for the purpose, trick flying, and aerial manoeuvring, none of which performances came off. All had seen moving pictures of aviators’ performances, read thrilling accounts of deeds of the airmen, and so all knew that men could fly: and to see it done filled everybody who had come to the ground with interested expectation. They certainly did see Mr Badgery perform three short flights, but were disappointed at the limited character of the display. Some of the people were disappointed at not seeing trick flying, but it was explained that the weather conditions were not at all suitable.